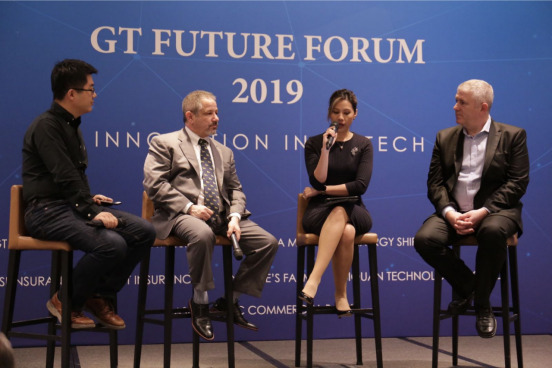 SINGAPORE / ACCESSWIRE / March 15, 2019 / Global FinTech leader GT Group has held GT Future Forum 2019 in Singapore on 14th March. The main topic of this year's Forum is "Innovation in FinTech". The forum was co-hosted by Singapore GT Group, NASDAQ listed company Ideanomics.Inc, China Merchants Energy Shipping (Singapore), Asia Pacific Commercial Bank, Singapore listed company Nature's Farm, Cambodian Company Biquan Technologies Co. Ltd, Thailand listed insurance company TSI Insurance and a number of innovative Fintech Companies. Key opinion leaders in FinTech has attended this event and given their insights on this topic， which includes Ideanomics Inc. Chairman Dr. Bruno Wu, Asia Pacific Commercial Bank CEO Mr. Zeng Qi Sheng, and TSI Insurance Executive Director Ms. Adela. At the forum, the guests discussed in depth the emerging concepts of insurance technology, financial technology, sharing economy, and the application of digital currency in different fields. They jointly released a number of innovative financial technology products and signed strategic partnership agreements and MOUs. At this forum, DICA consumption insurance jointly developed by GT Insurance and TSI Insurance will be grandly launched. DICA takes "consumption is investment" as its core concept, and creates a new investment dividend assurance model to provide consumers with diversified high-returns and protected investment programmes. DICA will enter into strategic partnership with real estate companies, FMCG company, gaming companies and commodity trading industries in this forum. The second focal point of the forum was the development and application of blockchain and digital currency. GT Group issued their digital currency GTB in 2018 and is currently the world's second-largest digital currency, the first being Bitcoin, valued at $70 billion. GTB adheres to the physical assets and technical services of GT Group's artificial intelligence section, payment section, insurance section, asset management section, smart city section, aviation section, etc., to develop and expand the areas of application for GTB. Being the world's leading AI-driven Fintech solution provider, NASDAQ-listed Company Ideanomics. Inc will provide comprehensive services for GTB in market value management, global compliance, and business development. On the other hand, as a traditional bank, Asia Pacific Commercial Bank will start the custodian business for GTB, and announced that it will use GTB as the bank's clearing currency in the future. The discussion of the innovative sharing model of COFO marked the new era of the sharing economy 3.0 GT Group announced the launch of the 'Sharing Aviation' program-COFO, which means CO-Fly with Ownership. The first batch will share ownership, share user benefits, and share profits of the company, based on the operation of 24 aircrafts of GT Airlines. The world's first aviation sharing program is born. It is believed that this forum will have far-reaching and lasting impact on innovation in the field of financial technology, and promote innovative FinTech companies to put their ideas into practice and take technology and financial applications in Southeast Asia and even the world to a whole new level.